Thank you Y2 for leading a fabulous class assembly to round off all your learning so far this year. What a great end to the spring term! child at home during the spring holiday! school on MONDAY 15th April 2019. Please remember that this term we are all striving to be the best we can be! Do you have a child who is due to start school in September 2019? Please give us a call to arrange a tour of our school. Willow Wood is rated as 'Good' by OFSTED and we would love to show you around. The nursery is filling up rapidly so if you have a 3 year old please come and see our children learning and playing in the great early years environment. School offers up to 30 hours nursery education and childcare, a breakfast club and 'Sunflowers' after school club Please contact the School Office for further information. 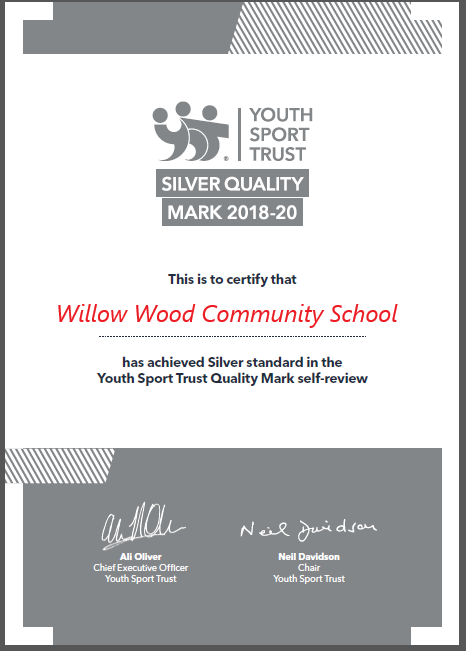 We are delighted that we have again received the Silver Mark in recognition of the commitment we made to competitive school sport at Willow Wood during the year 17-18. We also hold the Youth Sports Trust Silver Quality mark for our commitment to School sport, PE curriculum and Active lifestyles. This year we are aiming even higher! Willow Wood Community Primary School is a Good school! See the Ofsted page for quotes from the report. 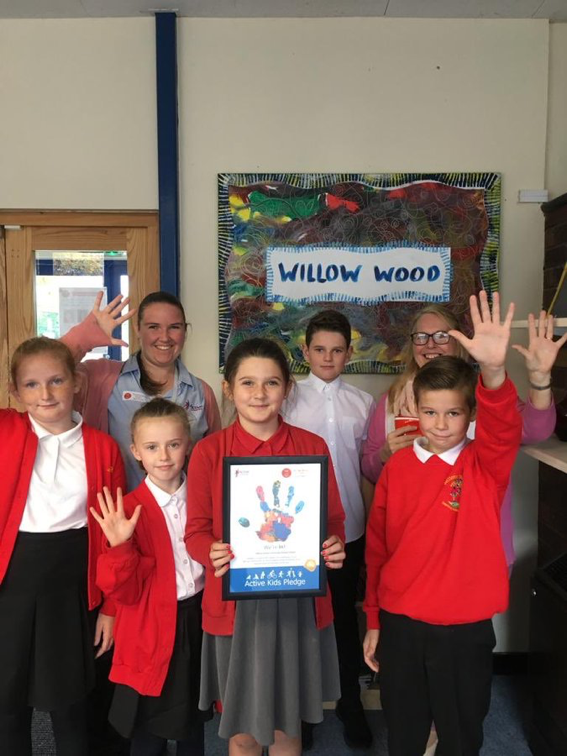 Willow Wood Community Primary School is a happy and successful learning community where everybody is welcomed, supported and challenged to achieve their best. We aim to create an open and welcoming learning community, where all voices are valued and listened to. We provide excellent teaching and learning opportunities within a broad, balanced and enriching curriculum so our children develop as happy, well balanced, caring individuals who can make good decisions for themselves and their world. Willow Wood is set in spacious grounds equipped with a good range of outdoor facilities to support learning; outdoor classrooms; a wooden trim trail; play equipment, a pond, a woodland and even an outdoor ampitheatre created by the children which is perfect for rolling down! The indoor learning environment has a campus feel and consists of 3 buildings which have been named by the children as - the Snowflake Building, the Sunshine Building and the Rainbow Building. The classrooms are all generously proportioned, light and airy. There are two halls, an art studio, library areas and community spaces - we are very fortunate to have so much space to carry out our fun, investigative approach to learning. Please click HERE to read the Headteacher's blog.